The TKS formed, together with the TK3, the most numerically important armoured vehicle in service in the Polish Army in September 1939. Like all ’30s generation tankettes, they were a good alternative to traditional tanks, being cheaper and a good proposition for light mechanized battalions. The TKS (1934) was developed from the TK3, itself derived from a licence-built Vickers-Armstrong Carden-Loyd Mk.VI. 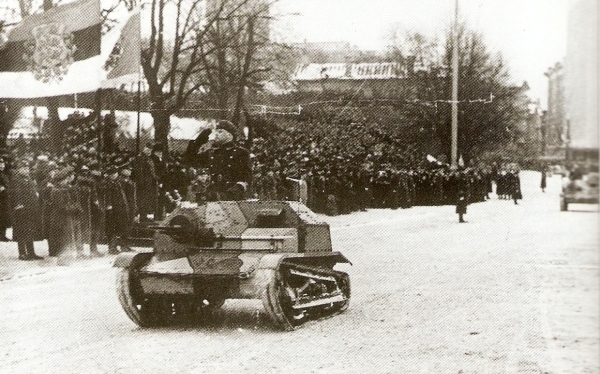 The TK3 was first trialed in 1929 near Warsaw. Domestic modifications included a more flexible suspension, and production took place after the TK1 and TK2 prototypes in 1930. But even while the production of the TK3 took place, attempts were made to increase the armor and armament as well. The French Hotchkiss 13.2 mm (0.52 in) and 20 mm (0.79 in) long-barrel antitank guns were tested. The final TKS prototype was ready by June 1933, and production took place from March 1934 until 1938, with upgraded armor and Polish engine. Like the TK3, the TKS had a single 7.92 mm (0.3 in) Hotchkiss wz.25 or wz.30 machine gun. However, the superstructure was completely modified. 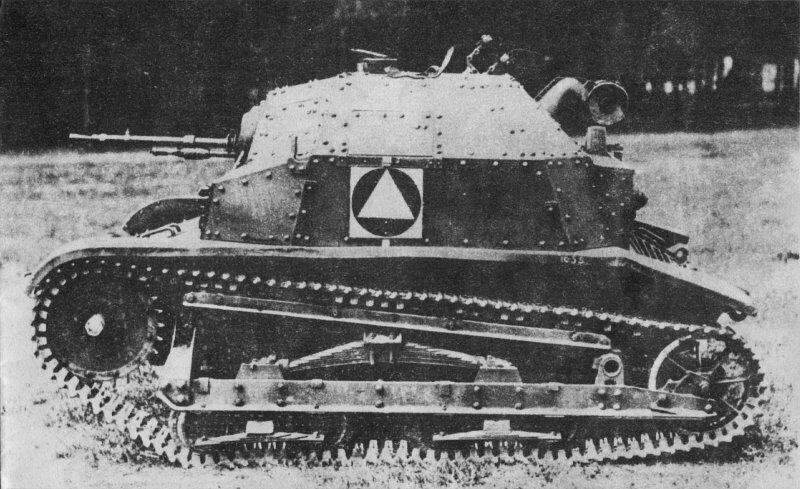 A prominent tumblehome with sloped armor allowed the machine-gun to be mounted further forward. The side armored shutters and vision slits were also modified. The exhaust was modified and a commander/gunner periscope was added. Armor made of hardened steel was bolted to a central frame and slightly sloped, ranging from 6 to 8 mm (0.23-0.31 in). 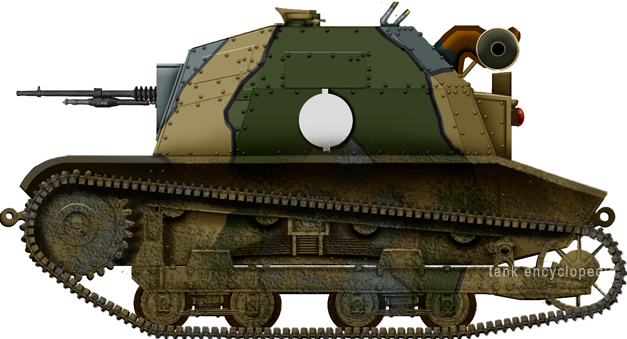 The June 1933 prototype had thicker, cast steel armor. 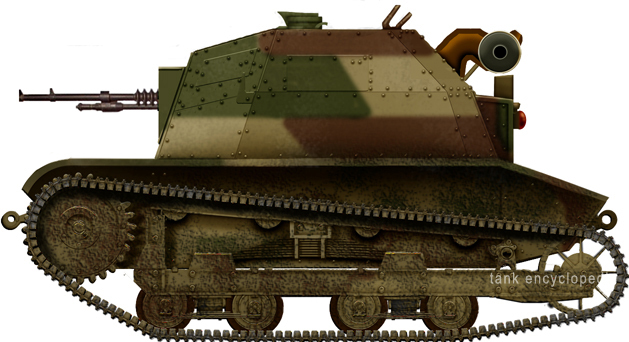 The TKS had the same dimensions as the TK3, but was significantly heavier and slower than the TK3 and than the original Carden-Loyd tankette. It incorporated many minor improvements dictated by field experience. Production started in March 1934. 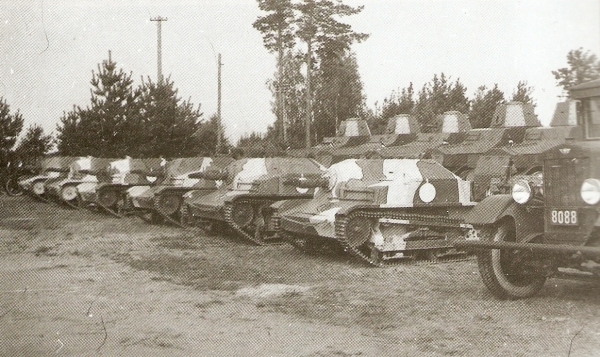 In all, 290 of these improved tankettes were built until September 1939. Based on registration plates, the first ten pre-production prototypes had iron hulls, for training. 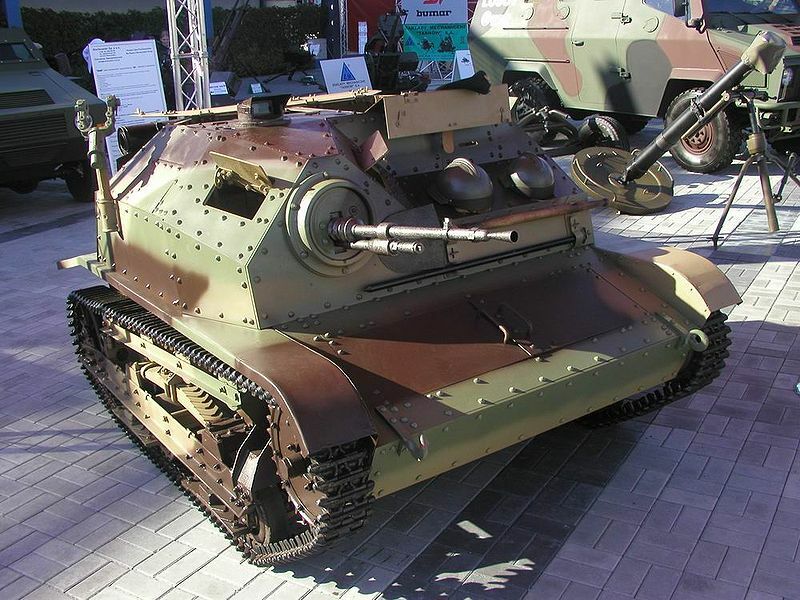 In 1938, a single TK3 prototype was equipped with Polish wz. 38 20 mm FK model A (0.79 in) high velocity antitank gun.Only 20 to 25 units were converted as anti-tank units in time, out of an order for 80 TKS and 70 TK being converted in total. The final prototype was ready in January 1939, and conversions started by batches in May and July 1939. The gun was capable of penetrating 40 mm (1.57 in) at 200 meters (660 ft). Produced in Poland, it was derived from the Swiss Solothurn S18-100 (4 were acquired in 1935). Other armament was evaluated, like Oerlikon and Madsen gun. The FK-A was manufactured by Fabryka Karabinów but in short supply, having to also fulfill the needs of the Air Force and AA units. Perhaps 18 TK were in the process of being converted before September 1939, but their fate is unknown. Although better armored and just as numerous as the TK3, the TKS was no match for their German counterparts, save for the machine-gun armed Panzer Is. At that time, even some reconnaissance armored cars were armed with a 20 mm (0.79 in) autocannon. When opposing the Soviet Forces it did not fare any better, being pitted against such vehicles as the T-26, T-28 and BTs. TKS were attached to infantry units, but also to cavalry brigades and independent companies of 13 vehicles each. The only kills registered came from ambushes led by the 20 mm armed TKS antitank brigade, in particular those attributed single-handily to Edmund Roman Orlik. He claimed 13 tank kills in 3 direct-actions against German forces. One such action resulted in the death of lieutenant Victor IV, Duke of Ratibor. Tankettes of all types were captured by the Germans and used for training purposes, supply and to counter insurgents. A TKS tankette with 1934 “Japanese style” camouflage. 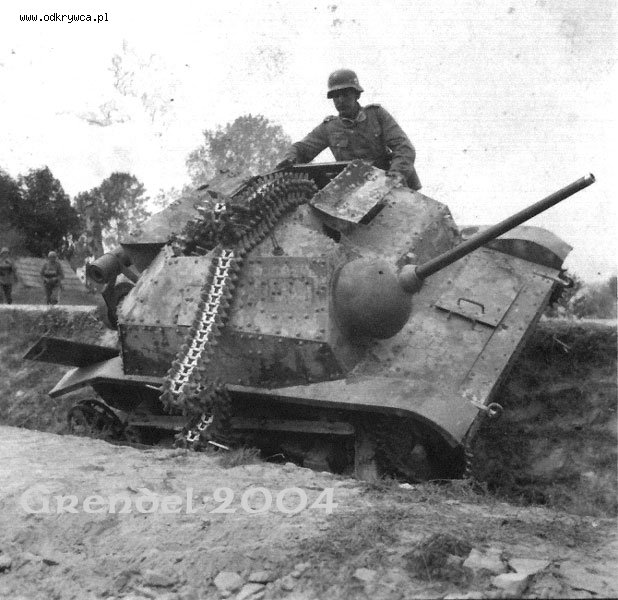 A TKS tankette with the typical “checkerboard” camouflage, mainstream in September 1939. TKS-NKM/20 mm Solothurn or NKM antitank version converted in 1938. Only 20 to 25 were in active service in September 1939. TKS with 20 mm cannon. Hi Mark, thanks for this info, it has been added and you comment will stay as a backup. By the way we just started a new section dedicated to mini-biographics, if you are sufficiently interested in Edmund Roman Orlik to bring more meat on the table, be our guest ! Would love to, where do i find this section? I want to write an article about TKS-B, improved version of TKS… I will write “prototype” of this text on some abandoned website and give a link here to rewrite. This article is little meager. Here is nothing about TKS with 37 mm Puteaux cannon or about TKS conversions like TKS-D (tank destroyer). It should to be developed. You can rewrite it… Or just take some informations to new article. Would you be happy to give either your skype or facebook contact to one of our Senior members? Well, if You think that I deserved for it… Yes, send me their E-Mail or Facebook adresses. Does TKS (and TK, etc.) stand for anything? I’ve searched so hard and come up with nothing. I know that in 7TP, the letters have meaning, but is that true for the TKS as well?